This recipe came to me from Ruthie, mom to a friend from high school. We made this with her so many times during high school that I should not have needed the recipe written down but she gave me this recipe when I was a new bride. Let me start by saying my friend Mary’s mother, Ruthie was a genius. As high schoolers we were so self absorbed, so clueless, so totally out of touch with anything that did not revolve around us. The thought that Ruthie was using baking and chores as a way to get information from us never entered our pubescent heads. Today to honor Ruthie, I will painstakingly slice the cranberries by hand and think of this wonderfully wise woman’s genius. This recipe calls for a cup and a half of sliced cranberries. These days I normally just wash the cranberries and slice them in the food processor but in the early 1970’s most homes did not have a food processor. At Ruthie’s house we sat at the kitchen table and sliced bags and bags of cranberries. My friend Mary had chores before we could spirit her away to any event, so we helped her finish her chores. At the tender age of 16, I never clued in to the fact that while we were laboriously hand slicing bags of cranberries, Ruthie was in the other room listening to our plans. She knew that teenage girls could not keep quiet. She also knew if she gave us a chore that took more than a few minutes, we would start talking about who we were going to see, where we were going, what we expected to happen, when so-and-so would show up…….you know, all the things that a teenager will not willingly tell their mom but the mom needs to know for peace of mind. So, Ruthie asked us to slice cranberries. She always gave us her words of wisdom that, “many hands make light work”. All we knew was if Mary wanted to leave, we had better help with the chores. Without hand slicing the cranberries, this recipe goes together quickly and is an excellent holiday tea bread as well as a tasty muffin. 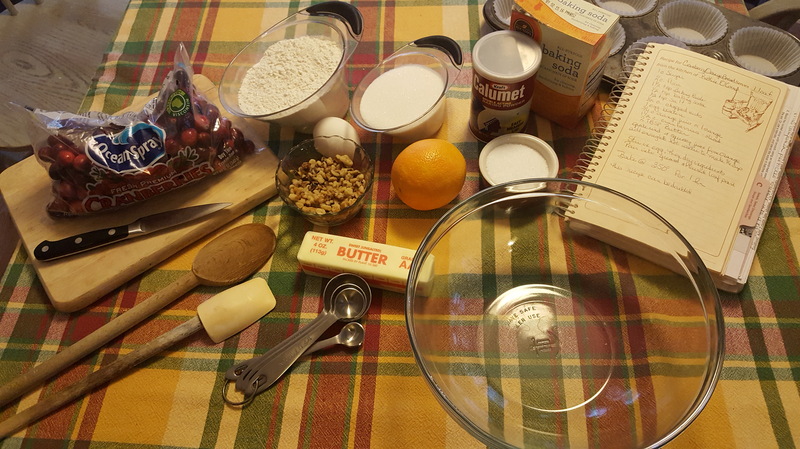 To photograph the recipe today and to honor Ruthie, I will hand slice the cranberries. I cannot make this recipe without fondly thinking of Ruthie and the lessons she taught us all, through her actions as well as her “Ruthie-isms”. She was always chatting with us, cajoling us into some sort of volunteer service, and gently guiding us into being better young ladies – those that made better choices. Over forty five years later, all of our group are contributing members of society. We all consider the impact on our families, friends and community before taking any action. But, most importantly we see the value in friendships and the many ways friends support and make each other’s lives a little easier through that help. Even though Ruthie is no longer with us, she lives on in our minds and hearts. So, in this season of Thanksgiving; Thank you Ruthie for loving us enough to eavesdrop on our conversations, keep us busy and teach us that if we “give of ourselves first” that all will be well with the world. Sift together flour, salt, baking powder and baking soda. Set aside. Into large mixing bowl, grate rind of orange. Cut remainder of orange in half and squeeze orange juice into measuring cup and add enough hot water to make 3/4 cup. You can also just measure pre-made orange juice but muffins are much better with orange zest and fresh juice. With a spatula or wooden spoon stir together orange zest, orange juice, water, butter and sugar till well blended. Stir in beaten egg till blended. Add dry ingredients and stir till well blended. Batter may be a little lumpy. Fold in sliced cranberries and chopped walnuts. Using an ice cream scoop, fill muffin cups. Bake at 350F for 30 minutes or till toothpick tests clean. Remove from pan to cooling rack and allow to cool completely. NOTE: If making into a cranberry orange loaf, bake for 1 hour at 350F. Remove from pan to cool. Bread can be wrapped in plastic wrap and frozen up to 3 months.